Name: Yuri Shibuya (渋谷有利 Shibuya Yūri) Aliases: Yuri Your Majesty - by subjects and foreign citizens/rulers Your/His Majesty, the Demon King King Yuri Double Black Demon King - by Dragon poachers Wimp - by Wolfram Shibuya - by Murata Yu-chan - by his family Young Master (bocchan) - by Yozak Shibuya Yūri Harajuku Fūri Harajuku Fūri used by Yuri as an alias when he is outside the castle Race: Demon Gender: Male Age: Episodes 1-78: 15 * Episodes 79-117: 16 Birthday: July 29 Hair Color: Black Eye Color: Black Weight: 52 kg Status: Demon King (Maoh), engaged to Wolfram von Bielefeld. Clothing: Black Japanese School Uniform described by von Christ as cloaked in the night. The stories protagonist. Born and grew up in Saitama prefecture. A high school student who enjoys baseball more than textbooks. He was 'named' by Conrad when he mentioned to Yuri's mother how, where he comes from, Yuri means July. Early in the show, bullies make fun of Yuri's name by calling him "Shibuya Yūri, Harajuku Fūri" (advantage Shibuya, disadvantage Harajuku) — a reference to popular districts of Tokyo. In the English dub, this becomes a pun on "Yuri is short for urine." When Yuri arrives in Shin Makoku, he is declared the 27th Maoh of the Mazoku ("Demon Race"). Yuri easily gets caught up in his emotions to the point of losing control of himself. He is a little bit quick to anger, and once he's on a rampage he can't even stop himself. A music teacher he once had dubbed his rants "the Turkish march". When he is angry or sad or has a strong emotion his natural powers emerge. Yuri uses expressions from historical dramas when he gets this way, which probably has to do with the fact that he loves historical dramas. They call this condition is sometimes called Maou mode (「上様モード」 (uesama mo-do) (emperor mode) in Japanese). In the anime this form can be recognized mainly by the longer hair and demon eyes. He can summon powerful magic (majutsu), even in the human territories (a notable feat as most Mazoku cannot perform magic outside their country), and even more remarkable he can use majutsu in souseki filled areas such as the souseki mines where other mazoku have difficulty standing and even breathing. Yuri's magic is manifested in various shapes - usually one or more great water dragons, or some messy magical "creature" made from mud, food morsels etc. After spending time in this form, Yuri becomes worn out and in some cases passes out and doesn't remember what happened afterwards. Later, Yuri learns to control his power and uses it to close the first of the Forbidden Boxes. In the beginning of season 1, he often fainted after he used Maryokou (especially in Human land) due to exhaustion. But later on he was able to maintain his consciousness after returning to his "former self". Yuri has many allies and friends. His closest allies are Wolfram, Conrad, Günter, Gwendal, Murata, and Josak. They help Yuri throughout the series. 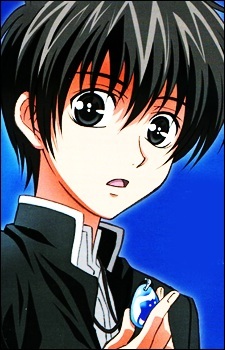 At his first encounter with Wolfram von Bielefeld he ends up engaged to him due to a mishap: Wolfram, angry that Yuri has been chosen as the Maoh, makes the mistake of insulting Yuri's mother - which earns him a slap. Slapping another noble on his or her left cheek is the way in which Mazoku propose marriage (some consider the slap as unmanly, but Yuri explains in the light novel that he only slapped Wolfram because he has a beautiful face, otherwise he would have punched him). Incensed by this insult, Wolfram challenges Yuri to a duel, which is also mistakenly accepted because of Yuri's unfamiliarity with Mazoku custom (he picked up the knife that fell off the table). Yuri is in fact the reincarnation of, and therefore is, Susanna Julia von Winncott, who died during the war against humans 20 years ago. The pendant Conrad gave to him belonged to her. He retains some of Susanna's skills, as demonstrated when Adalbert brought out his stored language memory in his soul; he begins to understand the mazoku language but because Suzanna Julia was blind he is unable to read the language, although, he can read raised letters with a finger. And sometimes when he goes into a crisis mode Julia's influence comes to the front of his brain and he temporarily loses eyesight. In the last fight with Soushu, Yuri defeated him, and results on him being said as the greatest Maoh after defeating Soushu and freeing the Original King from the dark power. Because of that, Yuri is able to travel between worlds even without the help of the Original King.